Liz Chandler founded Real People Pilates ® as a result of her desire to produce a Pilates video that would inspire and cater specifically to people over 50 and has gone on to produce DVDs for all age groups. The name Real People Pilates was coined when considering the best format and style to appeal to those real people over 50; one that would be approachable, beneficial, understandable and be an easy to follow exercise programme. Liz has over 20 years experience in the fitness, dance and Pilates field. It was through her career in dance that she became aware of Pilates. When she was incapacitated by 2 spinal disc bulges/protrusions Liz turned to Pilates as a means of rehabilitation. Her osteopath stated she had never seen such a speedy recovery from this type of injury. A mind, body exercise system that delivers profound results. Originally from California Liz Chandler came to Pilates from a professional contemporary dance background. With a BA in Dance from the University of California (UCLA) she went on to perform professionally with companies in both the US and the UK. She has taught and lectured in dance for 16 years including; Bath City College and the University of Bath, England. Liz was head of fitness at Circomedia, Centre for Circus and Performing Arts for 11 years. She has been teaching Pilates for over 15 years having trained with both Body Control Pilates and with Suzanne Scott and the Pilates Foundation. Liz is passionate about continuing development and has done further courses in the US and UK with Marie-Jose Blom, Tom Myers, Madeline Black and Alycea Ungaro, to name a few. She presently teaches Pilates at her studios Pure Moves, Frome. She taught at The Scott Studios, Castle Cary for eight years and has worked for Bath Rugby teaching Pilates to premier players for both performance enhancement and rehab settings. 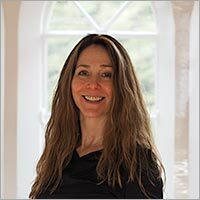 Liz is a Pilates educator, presenting continuing education workshops for the past 10 years for Pilates Foundation UK and recently for APPI and IPTA. In addition she has presented at conferences and development workshops around the UK.